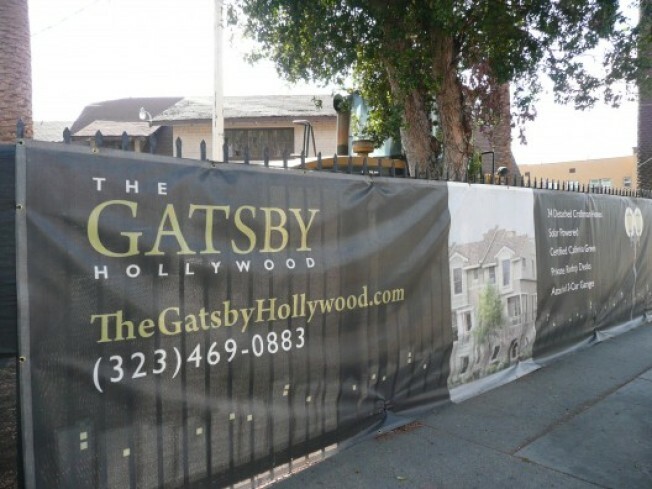 The site of a former convalescent hospital, work has started at Wilcox and Fountain in Hollywood, home of the forthcoming Gatsby Hollywood development, a 34-brownstone project (yup, California brownstones, according to the web site), that's being described as L.A.’s first "solar-powered urban enclave." The project is also taking advantage of that small lot ordinance. As for that brown building, that's the Orchard Gables Cottage, a turn-of-the-century cottage that was saved; last we heard, the Hollywood branch of the Community Redevelopment Agency was hoping to turn it into an arts and education community center. A web site is also up and running, and advertising "the Authentic Craftsman architecture" and the "Solar-powered homes." Gatsby, solar, brownstones, historical cottage: So much going on.